Zoran Poposki's work has been selected to appear in Interruption: 30th Ljubljana Biennial of Graphic Arts from 14 September to 24 November 2013. The 30th anniversary edition of the Ljubljana Biennial of Graphic Arts, one of the oldest biennials in the world, is curated by Deborah Cullen, Director and Chief Curator of the Miriam and Ira D. Wallach Art Gallery at Columbia University in New York City. 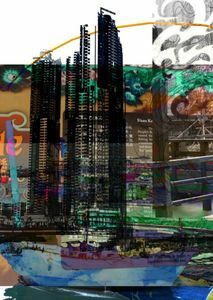 Poposki will present a series of archival pigment prints on canvas and screen printed in acrylic paint, as part of the larger project "Hong Kong Atlas" combining psychogeography, photography, printmaking and video to explore cultural translation and transcoding. The producer of Ljubljana’s International Biennial of Graphic Arts is the International Centre of Graphic Arts (MGLC) in Ljubljana, a museum specializing in the art of printing, artists’ books and ephemera. The main presentation of the Biennial will take place in the MGLC and the Moderna Gallery, but there will be concurrent exhibitions in various spaces around the city, including an historical overview of the Biennial, and a project dedicated to Regina José Galindo, who won the jury award in the last edition. This event will also have a juried prize that is a solo project presented in the next edition. The thirtieth edition of the Biennial will be an occasion for some serious self-reflection. It will explore the idea of evolution, highlighting some of the transformations and underlying endurance the expanded graphic field has undergone over the last half-century. A renewed contemporary engagement with traditional means and the re-thinking of vintage processes and forms has invigorated the polygraphic terrain around the world. It will offer an insight into the global biennialisation of the art system. The curator of the 30th Biennial of Graphic Arts, Dr. Deborah Cullen is director and chief curator of the Miriam and Ira D. Wallach Art Gallery at Columbia University in New York. In 2012, she was chief curator of the triennial El Panal/The Hive: 3ra Trienal Poligráfica de San Juan: América Latina y el Caribe in Puerto Rico. Before that, she was director of curatorial programmes at El Museo del Barrio in New York, where she edited the extensive 500-page anthology Caribbean: Art at the Crossroads of the World (El Museo del Barrio and Yale University Press, 2012). Among her major exhibitions are Nexus New York: Latin/American Artists in the Modern Metropolis (2009), Retro/Active: The Work of Rafael Ferrer (2010) and the international travelling project entitled Arte no es Vida: Actions by Artists of the Americas, 1960–2000 (2008–2011), for which she received the Emily Hall Tremaine Exhibition Award. She is the author of a monograph on Rafael Ferrer (UCLA, 2012).